A variety of considerations must be made whenever you are planning the construction of a new website. You want to make the best first impression possible, as many websites that fail to do so may never see some visitors ever again. Between balancing an aesthetically pleasing design with a functional one, considering your plans for promoting and marketing the brand, and making SEO success a reality, some details may get lost along the way. Unfortunately, one very important detail – the selection of your domain name – is something that is made almost entirely before the rest. As such, it’s important to pick an appropriate domain name based on your mission, goals and industry. In order to make the process simpler, we’ll discuss below some elements that must be considered when selecting your domain name. Determining how you want people to view your brand or business from the first time they see your domain name is important in establishing an overall identity. Not all domain names perfectly match the content of the page, but it is generally a good idea to somewhat connect the two. 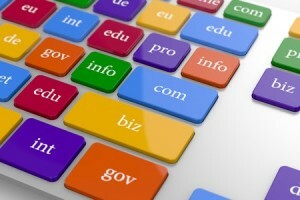 There are four main components you will want to consider when selecting a domain name: who, where, which and what. These four elements will not all be present in your domain name necessarily – in some cases, you will pick between two sets of two – so it’s important to establish early on whether you want to base the domain name on a brand identity or on a functionality. When pinging URLs to search engines, each one of these two choices can have advantages and disadvantages. Another element to consider in the creation of a domain name is location. While including location in the domain name may create a longer variant, this can sometimes be as simple as two letters – for a country or for a state – and can even be included in the TLD (such as “.us” or “.co.uk”). Your brand may wish to opt for a more generic domain name and TLD if it serves a broader market, especially in international cases. Then again, some brands decide to create specific domain names for each of their jurisdictions – this can help improve SEO performance in local search results by pinging URLs of relevance in those niche searches. If you operate a brick and mortar business that wishes to have an online presence, then location can be a valuable addition to the URL structure. In all other cases, however, it may not be necessary. How exactly does your brand fit into the broader industry in which you operate? Do you produce a genuine brand of products and services, or are your offerings more generic? This will affect how the domain name is structured, or at least it should. For websites that prefer to get their products or offerings out quickly but who don’t have a brand of product all to their own, a generic domain that uses keywords and product description is more suitable. For websites that do produce their own custom products and want to associate their availability with the in-house brand, then a branded domain is the better route.